Variable retention harvesting is a silvicultural system that focuses on retaining key elements of stand structure at the time of logging and is increasingly being used worldwide. We describe the design and establishment of a variable retention harvesting experiment established in the Mountain Ash (Eucalyptus regnans) forests of the Central Highlands of Victoria, south-eastern Australia. The experiment was instigated in 2003, and the work to date has shown that it has environmental benefits for certain groups of small mammals, birds, and vascular plants. The experiment has been integrated with an ongoing long-term monitoring program as well as other experiments such as those in post-fire salvage-logged areas. Collectively, the results of various studies suggest that the potential value of variable retention harvesting extends beyond green-tree logging to post-fire salvage logging environments. We outline some of the challenges in, and new perspectives derived from, implementing and maintaining our experiment. This included difficulties protecting islands from high-intensity post-harvest regeneration burns and threat of declining funding undermining ongoing project viability. A critically important perspective concerns the ecological and economic context in which variable retention harvesting is implemented. In the particular case of Mountain Ash forests, assessments using formal IUCN criteria classify the ecosystem as being Critically Endangered under the Red Listed Ecosystem approach. As a result, Mountain Ash forests are at a high risk of ecosystem collapse. Further logging will increase that risk, making the basis for continued harvesting questionable. In addition, economic analyses suggest that the value of natural assets, like water production, far outweigh the value of the wood products harvested from the Mountain Ash ecosystem, again leading to questions about the viability of ongoing harvesting. We therefore conclude that whilst variable retention harvesting has the potential to contribute to biodiversity conservation in Mountain Ash forests, broader ecological and economic contextual issues (such as the values of competing resources like water yields and the heavily degraded state of the forest) may erode the case for its broader application. ….an approach to harvesting based on the retention of structural elements or biological legacies from the harvested stand for integration into the new stand to achieve various ecological objectives…..Major variables…..are types, densities and spatial arrangements of retained structures. A fundamental part of variable retention harvesting system is that retained structures need to be within the boundary of the harvested area of a cut-block and not confined to the edges of a harvest unit (Lindenmayer and Franklin 2002). Since early recommendations for the trialing and adoption of variable retention harvesting systems, a wide range of studies has explored the efficacy of the approach (Baker and Read 2011; Fedrowitz et al. 2014; Gustafsson et al. 2012; Halpern and Raphael 1999; Lindenmayer et al. 2012b). In Australia, there has been a widespread application of variable retention harvesting in Tasmania (Baker et al. 2009; Baker and Read 2011), but until recently, the approach has received limited operationalization in mainland Australian states. However, a variable retention harvesting experiment was established in 2003 in the Mountain Ash (Eucalyptus regnans) forests of the Central Highlands of Victoria, south-eastern Australia (Lindenmayer et al. 2004) (Table 1). In this paper, we outline the design and implementation of the experiment and briefly describe some of the key findings. We then outline some of the challenges in implementing and maintaining the experiment. We conclude with some key insights and perspectives generated from our past 15 years of work on the variable retention harvesting experiment in the Victorian Mountain Ash forests. The response of the most common species of small mammals (the bush rat and the agile antechinus) was most marked on clearcut sites following the application of the post-harvest regeneration burn to remove logging slash and create a bed of ashes to promote the growth of a new stand. There were no differences in animal abundance between retained islands and unlogged controls. There are no island size effects on small mammals. The response of birds to retained islands was intermediate between unlogged controls and clearcut areas, with the most pronounced negative effects being in clearcut areas, particularly after the application of a regeneration fire. More complex species-specific responses occur for individual bird taxa, but most generally showing a similar pattern to that quantified for overall bird species richness. There were no island size effects on bird species richness or individual species of birds. Our variable retention harvesting experiment was established in the Mountain Ash forests of the Central Highlands of Victoria which is a 60 km × 80 km region northeast of the city of Melbourne. These are spectacular temperate eucalypt-dominated forests which can approach 100 m in top height (Ashton 1975). These forests are characterized by cool, wet climatic conditions (Lindenmayer et al. 1996) and occur in some of the wettest environments in Victoria with some places receiving more than 2500 mm of rain annually. Wildfire is the primary form of natural disturbance in Mountain Ash forests with high-intensity and high-severity conflagrations producing even-aged stands (Ashton 1976). Mountain Ash forests support habitat for a wide range of fauna, including several species of conservation concern such as the Critically Endangered Leadbeater’s possum (Gymnobelideus leadbeateri) and the Vulnerable greater glider (Petauroides volans) (Lindenmayer 2009). These forests also generate most of the water for the five million people of Melbourne (Keith et al. 2017; Vertessy et al. 2001) and store large amounts of carbon (Keith et al. 2009). There is also a significant tourism industry associated with Mountain Ash forests (Keith et al. 2017). Clearcutting is the conventional form of logging in Mountain Ash forests (Flint and Fagg 2007; Lutze et al. 1999). However, there have been long-held concerns about its environmental impacts, including on native plants and animals in Mountain Ash forests (Lindenmayer 1994; Warneke 1968). Various initiatives by the Victorian Government, such as the Silvicultural System Project in the late 1980s, sought to identify alternatives to clearcutting (Squire 1990), but it remained the predominant form of harvesting in wet eucalypt forests, including those dominated by Mountain Ash (Campbell 1997). In 2002, an international Forestry Roundtable meeting was held at Marysville in the Central Highlands of Victoria to discuss options for alternative forms of harvesting to clearcutting with key presentations from foresters around the world including Sweden, Finland, Canada and the USA as well as those from elsewhere in Australia (Tasmania and Victoria) (Lindenmayer and Franklin 2003; Lindenmayer et al. 2004). Following this meeting, the Government of Victoria agreed to implement a variable retention harvesting experiment, with the ecological monitoring components of the work led by researchers from The Australian National University (Lindenmayer 2007). Work commenced in 2003 and monitoring of the project continues to this day (e.g., Lindenmayer et al. 2010; Lindenmayer et al. 2018c). The variable retention harvesting experiment established in the Mountain Ash forests is a study of aggregated retention which focuses on retained islands of two sizes (1.5 ha and 0.5 ha) within otherwise clearfelled cutblocks (Lindenmayer et al. 2010) (Figs. 1 and 2). Dispersed retention has not been examined because single isolated trees or small clumps of trees are highly vulnerable to a rapid decline in condition and/or collapse within cutblocks (including areas characterized by dense post-harvest stand regeneration) (Lindenmayer et al. 2018a; Lindenmayer et al. 2016). This is likely due to wind and climate exposure as well as damage associated with the high-intensity fires lit to promote the regeneration of harvest units after logging. The variable retention harvesting experiment is underpinned by a replicated and blocked treatment structure. Within each of six blocks, there are four treatments: (1) an uncut forest, (2) a conventionally clearfelled forest, (3) a cutblock with a single 1.5 ha retained island, and (4) a cutblock with a three retained islands, each measuring 0.5 ha in size. The four treatments and six blocks correspond to a total of 24 sites within the full experimental design (Lindenmayer et al. 2010). All treatments were located in forest that was regrowth after the 1939 wildfires to avoid confounding the effects of stand age and treatment in the experiment (Lindenmayer et al. 2010). Stands of 1939 regrowth forest are the primary age cohort currently logged in the Mountain Ash forests of the Central Highlands of Victoria. We established permanent sampling plots within each of the 24 sites to quantify the responses of small mammals, birds, vascular plants, and trees to the experimental treatments. We completed sampling before cutting commenced and then repeatedly after the full sequence of steps in timber harvesting operations were implemented, that is, pre-harvest, immediately post-harvest, immediately after the post-harvest regeneration burn, and then repeatedly as a new stand of forest regenerated on the cut area of harvest units (including around the locations of the retained islands) (Lindenmayer et al. 2010). We used the broadly same plot layout and sampling regime for all treatments within each block of the study. Hence, the survey methodology was the same for all sites in the experiment. We have integrated the variable retention harvesting experiment with a series of other long-term studies and experiments in the Mountain Ash forests of the Central Highlands of Victoria. Indeed, extensive long-term research and monitoring pre-dated the implementation of the variable retention harvesting experiment. This work has included a network of > 160 long-term sites surveyed for a wide range of animal groups as well as vascular plants and bryophytes (Lindenmayer 2009). Many of these sites were first established in 1983 and have continued to be monitored more than 35 years later. This network of long-term plots has provided important background information against which the results of the variable retention harvesting experiment could be compared. Following major wildfires in 2009, we established an additional blocked and replicated experiment on salvage harvesting in which 1.5 ha and 0.5 ha islands were retained within burned and subsequently salvage-logged areas. That study included burned but unlogged areas as well as burned sites that were subsequent salvage logged by conventional methods in which no islands were retained (Lindenmayer et al. 2018c). Importantly, similar survey protocols have been employed across our various studies and experiments. Therefore, collectively, the long-term monitoring sites, the sites in the variable retention harvesting experiment, and the sites in the salvage logging experiment have enabled us to compare results between studies and hence across a major disturbance gradient (Blair et al. 2016; Lindenmayer et al. 2018c). The variable retention harvesting experiment has encompassed studies of a range of groups of organisms. These include small mammals and birds as well as work on vascular plant abundance, patterns of plant germination, and rates of tree mortality and tree fall. We did not monitor the response of arboreal marsupials in the experiment as areas with a high density of large old hollow-bearing trees and thought likely to support species such as Leadbeater’s possum are generally excluded from harvesting. Surveys of small mammals (primarily the native bush rat (Rattus fuscipes), agile antechinus (Antechinus agilis), and dusky antechinus (Antechinus swainsonii)) in the variable retention harvesting experiment found that animals were relatively abundant within retained islands even though they were rare in adjacent cutover areas, particularly following post-harvesting slash burn of logging debris (Lindenmayer et al. 2010). Indeed, animals were no less abundant in islands than in unlogged controls. Unexpectedly, there were no significant effects of island size on small mammal occurrence. The overarching conclusion from the experiment has been that harvesting operations that lead to the retention of islands within cutblocks help promote post-disturbance recovery of this group of mammals (Lindenmayer et al. 2010). We found that forest birds responded positively to Variable Retention with many species significantly more likely to occur in retained islands relative to conventionally clearcut areas, although rates of occurrence were nevertheless significantly lower than control sites within the unlogged forest (Lindenmayer et al. 2015b). Similar to the response quantified for small mammals, we found no evidence of island size effects (Lindenmayer et al. 2015b). Other work on vascular plants and tree fall in the variable retention harvesting experiment has yet to be published. However, preliminary data suggest that rates of tree mortality and collapse are limited, although further long-term monitoring will be required to confirm initial patterns. It is also currently too early to determine the effects of variable retention harvesting on vascular plants. However, earlier work has suggested that retention islands are important for maintaining populations of key plants that are otherwise highly sensitive to conventional clearcutting operations. These include tree ferns whose populations can be significantly depleted in logged and regenerated areas (Blair et al. 2016) but persist well within retained islands (Ough and Murphy 1998). There has been a range of major challenges in implementing and then maintaining our variable retention harvesting experiment. Some of these are cultural and social whereas others are economic. First, many large-scale experiments are expensive to implement (Westgate et al. 2013) and this limits the appetite of governments to support them. To avoid this problem in the variable retention harvesting experiment, we overlaid its implementation on existing timber harvesting schedules following protracted negotiations with private logging contractors and State Government officials. However, this meant the study took 5 years to be fully implemented and encompass all treatments within experimental blocks. During this time, there was a decline in funding, thereby making it particularly challenging to maintain the experiment and implement all treatments in all experimental blocks. Cultural and ideological issues were a second major hurdle associated with the variable retention harvesting experiment. Prior to, and during, the implementation of the study, extended field days were held to discuss the study with different stakeholder groups. These were useful but typically served to further entrench pre-existing views. Members of some conservation groups have long maintained a strong level of opposition to any timber harvesting of native forests. Such opposition extended beyond clearcutting to include any kind of logging operation, including variable retention harvesting. Conversely, traditional foresters and some private logging contractors opposed the experiment because of their belief that clearcutting was the most efficient and safest way to log Mountain Ash forests. Indeed, one of the treatment blocks initially established had to be abandoned because the retained islands were inexplicably logged, further delaying the full implementation of the project. Importantly, some senior officials from the Victorian Government championed the work; otherwise, the experiment would never have been established. Finally, ongoing budget and staff cuts within the Victorian Government, coupled with frequent institutional restructuring has created enormous challenges in maintaining collaborative working partnerships between university researchers and new staff from government agencies. One of the results of the high levels of churn among departmental staff has been that key management data have not been gathered such as information on additional costs of implementing variable retention harvesting and the extent of reductions in timber yields from harvest units. The relatively long-term nature of the work in the variable retention harvesting experiment has created a third broad set of challenges. A critical one is that extensive recent fires (especially in 2009) and changes in the ecological and economic context of the Mountain Ash forest have altered the underlying rationale and drivers for ongoing logging in this ecosystem. This is further discussed in the following section. In addition, part of the experiment was damaged by the wildfires in 2009, thereby undermining the initial experimental design and forcing us to alter the nature of the work so that the data from the experiment as well as data from ongoing monitoring could be analyzed as part of a portfolio of inter-related projects spanning a gradient in forest disturbance types and intensities (Blair et al. 2016; Lindenmayer et al. 2018c). Finally, obtaining continued access to funding, even base-level funding, to maintain long-term research and monitoring has proven to be an enormous challenge. This has particularly been the case with the demise of the Australian Long-Term Ecological Research Network of which the research in the Mountain Ash forests was formerly a part. Yet, ongoing, long-term monitoring is critical, particularly given the ecosystem-wide demise not only in key structural types such as old growth forest (Lindenmayer et al. 2012a), but also the rapid decline in large old hollow-bearing trees (Lindenmayer et al. 2018a) and the decline of an array of forest-dependent vertebrate species (Lindenmayer and Sato 2018). Our work has shown that variable retention harvesting has positive benefits for maintaining and recovering populations of small mammals (Lindenmayer et al. 2010) and forest birds (Lindenmayer et al. 2015b). It appears likely that variable retention harvesting will benefit some species of native plants, particularly logging-sensitive resprouting species such as tree ferns (Ough and Murphy 1998), although further data collection will be needed to determine if initial patterns are maintained in the long term. Unfortunately, it has not been possible to determine if variable retention harvesting might be effective for enhancing the conservation of arboreal marsupials such as Leadbeater’s possum. A key challenge for these animals is that the age of the trees in the retention islands is currently ~ 80 years (having germinated after fires in 1939), but it will be 40–100 years before such trees begin developing cavities suitable for occupancy by cavity-dependent arboreal marsupials (Lindenmayer et al. 2017). Notably, the generally positive outcomes from variable retention harvesting extend beyond green-tree logging operations to those where fire-disturbed areas are subject to salvage logging, at least for forest-dependent bird taxa (Lindenmayer et al. 2018c) and most likely also for vascular plants (Blair et al. 2016). Our variable retention harvesting experiment has now been established for more than 15 years. For many years, it was the only example of variable retention in the wet eucalypt forests of Victoria and there was a general reticence to operationalize it more broadly across the State. This was despite parallel experiments and successful implementation in Tasmania (Baker and Read 2011). However, in 2014, this changed with the introduction of a target of 50% of cutblocks in “ash”-type forests to be harvested using variable retention harvesting, increasing to 100% if “operationally achievable” (Leadbeater's Possum Advisory Group 2014; VicForests 2017). Yet, despite having been shown to be operationally achievable (Baker and Read 2011; Lindenmayer 2007) and now having targets, implementation has been slow, with only 3.9% of montane ash forest cutblocks in the Central Highlands Region listed on the 2017 Timber Release Plan for the following 5 years listed as being cut using variable retention harvesting (VicForests 2017). 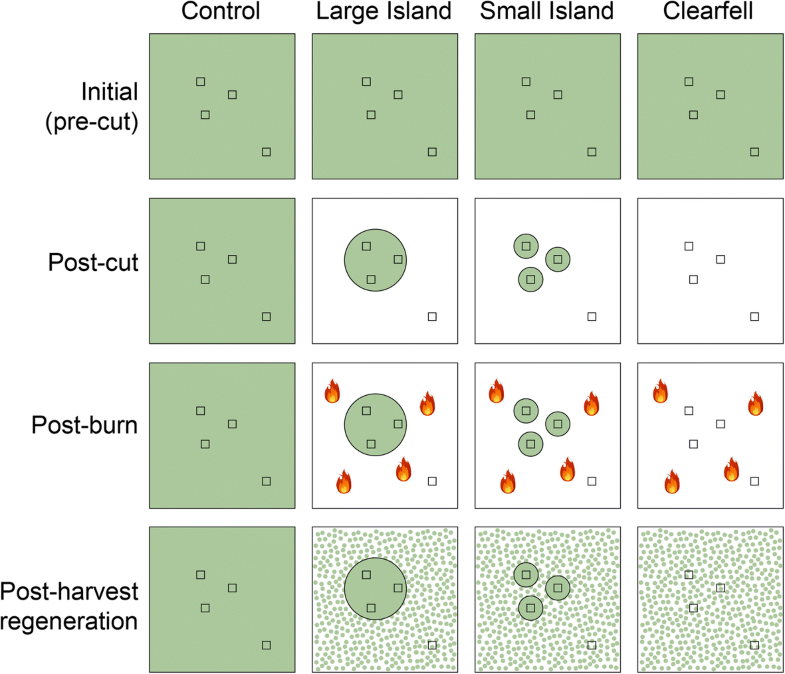 An additional issue associated with the on-the-ground application of Variable Retention has been major damage to retained islands resulting from high-intensity fires deliberately lit to promote the regeneration of harvested stands (see Fig. 3). Indeed, entire islands are often fully engulfed during such burning operations (Lindenmayer et al. 2015a) (Fig. 3). This problem is, in part, linked with the very high levels of logging slash generated by logging operations in Mountain Ash forests, sometimes exceeding 450 t per ha (Keith et al. 2014). Moreover, the smoke pollution generated from these logging burns can be substantial with subsequent negative impacts on air quality and human health (Lindenmayer and Taylor 2018). The solution to these problems remains unclear. Redistribution of logging slash throughout cutblocks (and away from islands) rather than it being heaped in large piles may reduce fire intensity and reduce damage to retained islands. However, these benefits may be offset by increased long-term damage to soil environments created by greater levels of activity by harvesting machinery, including more soil compaction and greater losses of soil nutrients (Bowd et al., unpublished data). One of the most profound issues associated with the implementation of Variable Retention in Mountain Ash forests has been dramatic changes in the ecological, social, and economic context of this ecosystem. The Mountain Ash ecosystem is classified as Critically Endangered under the IUCN Red Listed Ecosystem criterion (Burns et al. 2015) and is at high risk of ecological collapse. That is, the ecosystem is at risk of being characterized by impaired key ecosystem processes, depleted biodiversity, and a reduced capacity to generate important ecosystem services and products (e.g., wood and water). These risks are a result of very limited amounts of remaining old growth (1.16% of the forest estate), the rapid loss of remaining large old trees (Lindenmayer et al. 2018a; Lindenmayer et al. 2016), and the rapid decline in a wide range of key elements of the biota including arboreal marsupials and birds (Lindenmayer and Sato 2018). 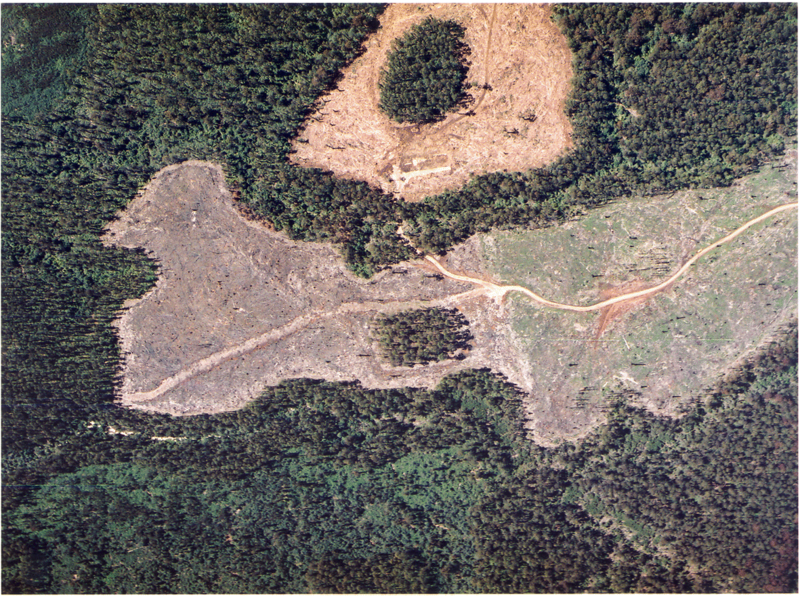 Further disturbance in this ecosystem, including through logging, would increase the risk of ecosystem collapse (Lindenmayer and Sato 2018). For example, increasing numbers of cutblocks in Mountain Ash landscapes has been found to elevate the rates of collapse of large old trees in adjacent uncut areas (Lindenmayer et al. 2018b) as well as drive the decline in populations of some species of forest birds (Lindenmayer et al., unpublished data). These ecosystem-wide changes also have the potential to influence the long-term effectiveness of variable retention harvesting. This is because of the potential decline in populations of animals at a landscape-level whose offspring would presumably have otherwise been the source of animals recolonizing areas that have been harvested and regenerated, including cutblocks containing retention islands. A further contextual issue for the implementation of variable retention harvesting relates to the timber availability and sustained yield. In the case of the Mountain Ash forests, widespread recent and past fires, coupled with extensive timber harvesting, have severely depleted the amount of forest available for sawlog production. This, in part, arose after the 2009 wildfires where 40% of the timber resource was burned but successive governments failed to reduce the sustained yield in response to large amount of forest burned. A result of this was overcutting of the remaining green (unburned) forest (Lindenmayer 2017). We argue that whilst the widespread implementation of variable retention harvesting would be a positive step, it would be unwise to do so without simultaneously implementing a major reduction in sustained yield. Failure to do so would result in a greater overall area affected by logging (as less timber is removed from each cutblock subject to variable retention harvesting, with more cutblocks are required to achieve the same volume) (Lindenmayer et al. 2015a). Notably, logging operations in the Central Highlands Mountain Ash forests have consistently failed to achieve Forest Stewardship Council certification, in part, because harvesting is not deemed to be ecologically sustainable. The economic context for variable retention harvesting is also an important consideration in its implementation. That is, the ongoing harvesting of forests needs to be assessed not only against the condition of the broader ecosystem subject to management, but also relative to the economic values of other natural assets that are diminished as a direct result of logging in the same ecosystem. Work based on environmental and economic accounting has revealed that the value of the timber and pulpwood derived from logging Mountain Ash forests is a small fraction (< 1/25th) of the value of the water from these same forests (Keith et al. 2017). The water yield from forests regenerating after logging is significantly lower than the water yield of intact, uncut (old-growth) forests (Vertessy et al. 2001). The economic case for ongoing timber harvesting, irrespective of the silvicultural system employed, would therefore appear to be tenuous at best (Keith et al. 2017), especially with the growth in demand for water from a rapidly growing population in Melbourne (which draws almost all of its water from Mountain Ash forests (Keith et al. 2017). The implementation and maintenance of the variable retention harvesting experiment in Victorian’s Mountain Ash forests has been a major long-term challenge and remains so. Nevertheless, the work has shown that this silvicultural system is operationally achievable and has environmental benefits for some key groups such as small mammals and birds and likely also vascular plants. Variable retention harvesting has value not only in green-tree logging but also in post-fire salvage logging where the retention of patches of retained forest can provide valuable habitat for birds and plants. Despite these positive outcomes, important operational issues remain, including the severe negative impacts of high-severity regeneration burns on the integrity and condition of retained patches within cutblocks. The low percentage of cutblocks currently harvested using this silvicultural system (< 4%) is also of concern and appears to be due to a lack of motivation to implement the method rather than operational hurdles preventing uptake. More significantly, the ecological and economic context for variable retention harvesting must be addressed. In some cases, including in the Mountain Ash forests, overarching issues like the sustained yield of wood production and the relative economic value of other natural assets (such as water) that are traded off when the forests are logged need to be carefully assessed. We thank Guillermo Pastur and Jerry Franklin for encouraging us to write this overview paper. Ian Miles, formerly of the Victorian Government, championed the establishment of the Variable Retention Harvesting experiment and the work would not have proceeded without his strong support. Claire Shepherd provided editorial assistance in manuscript preparation. The work summarized in this paper has received support from the Australian Research Council, the Australian Government (National Environmental Science Program Threatened Species Recovery Hub), the Victorian Department of Environment, Land, Water and Planning, and Parks Victoria. The Myer, Poola, and Wood Foundations have supported key aspects of our work in the Variable Retention Experiment in the Mountain Ash forests of Victoria. The funding bodies had no role in the design of the study, or the collection, analysis and interpretation of data, or the preparation of this manuscript. DBL conceived the study. All authors participated in the study design. DB and LM conducted the field data collection. All authors analyzed and interpreted the data. DBL drafted the manuscript with contributions by DB and LM. All authors read and approved the final manuscript. This study did not involve human subjects or material. Field studies and other non-experimental research on animals were conducted under protocols approved by the Australian National University Animal Experimentation Ethics Committee (protocol numbers A2017-32, A2014-08), and in accordance with licenses issued by the Victorian Department of Environment, Land, Water and Planning. Field studies involving plants were conducted in accordance with licenses issued by the Victorian Department of Environment, Land, Water and Planning.